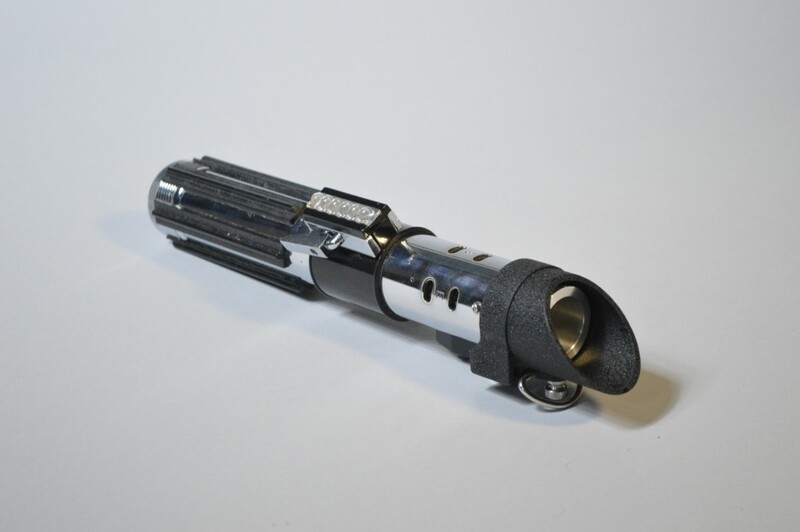 Recently, a customer in North Carolina reached out to me asking if I could convert his 2003 Master Replicas Darth Vader lightsaber to in-hilt LED with a Nano Biscotte soundboard. For those of you who follow my work, Vader conversions shouldn’t be anything new. I’ve done several and the builds are quickly becoming second nature for me. However, this was set to be a different beast. You see, while the Hasbro and Master Replicas Force FX lightsabers are more or less the same, the 2003 Master Replicas model was the first Vader to come out and, well, it’s very different than later renditions. The most notable differences between the 2003 hilt and its successors are its larger overall size and switch placement. The 2003 Vader is roughly half an inch longer than more recent versions and it’s around two or three millimeters wider as well. 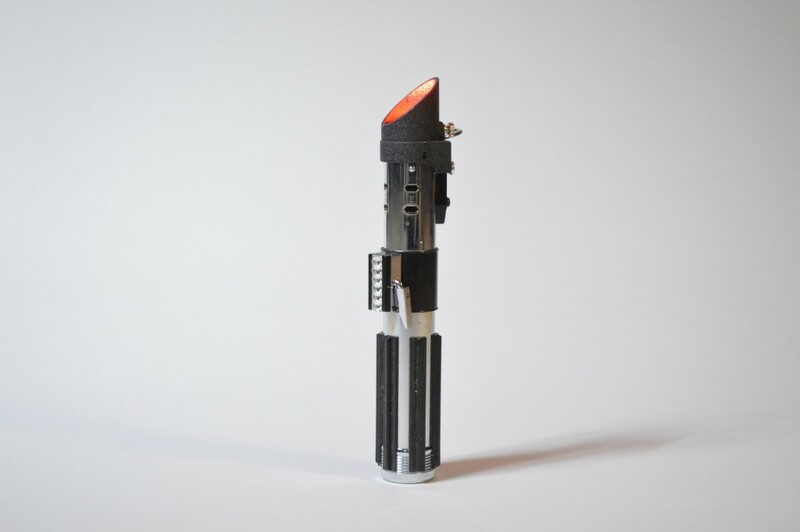 On top of that, the switch isn’t in the faux clamp box, but rather sits just beneath the saber’s emitter. There are a few other differences, but these are the most significant. The first thing I had to do was find a way to get the TCSS conversion kit inside the saber. Though the hilt had plenty of space, it wasn’t properly configured for the new blade holder and the emitter itself wasn’t bored out to accept a 1” blade. This meant that the first thing I needed to do was open up the internal diameter of the emitter. I removed the faux spring and then took a Dremel tool to the inside of the part, sanding until the new blade holder would slide into the saber’s body. I then needed to drill out the knurled screw hole in the emitter to accept the new retention screw as supplied by the kit. It should be noted that while the retention screw provides structural support on newer Vaders by threading into the saber’s body as well as the blade holder and emitter, the 2003 model forces the blade holder to sit higher, above the top of the saber body. To better support the blade holder, I removed some material underneath the emitter, then drilled and tapped the saber body and blader holder for an 8-32 button-head screw that would sit hidden underneath the emitter piece. This was further reinforced by a few layers of black vinyl that I added to the conversion kit, which increased its outer diameter and appropriately blacked-out the windows in the saber’s body. 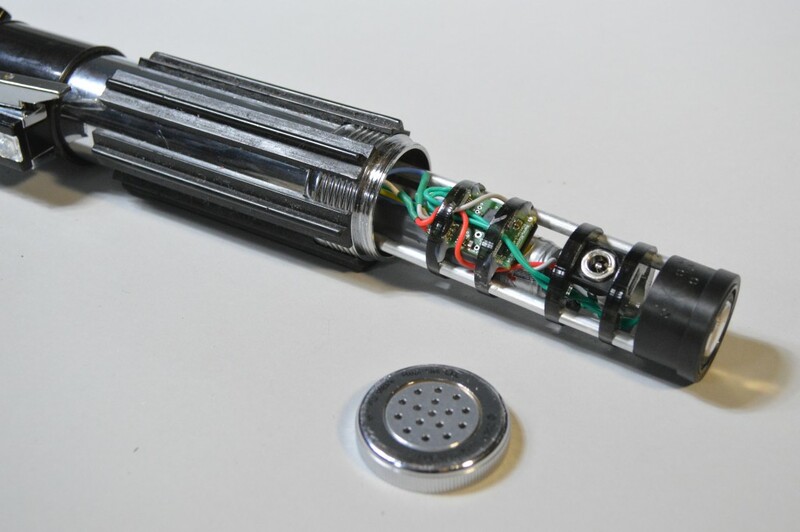 Lastly, I shortened the screws holding the emitter box in place – keeping them from interfering with the blade holder and drilled a hole in the saber body to facilitate the 4-40 screw that further secures the conversion kit. Most of the install work went into getting the switch inside this emitter box and the conversion kit inside the hilt. With the blade holder mostly in place, I next needed to find a way to deal with the switch. To route the switch wires back to the soundboard, I again called upon my Dremel. This time, I removed a substantial amount of material from the bottom of the blade holder – leaving plenty of room to fit the switch leads. I then needed to devise a mounting method for the switch. Fortunately, I had an extra 8-32 acetal thumbscrew laying around. I drilled and tapped the conversion kit just under the switch hole and then tried to install the screw. What I found at this point was that the plastic coating on the screw prevented the emitter box from properly seating. After removing the plastic with my Dremel, I reinstalled the screw. I then fed the momentary tactile switch’s leads into the hilt and sat it on the screw. Next, I reinstalled the emitter box. Finally, I used my Dremel to reshape the original switch cap so it would fit on top of the tactile switch. I then center-drilled the switch cap with a 1/8” bit and press fit it to the tactile switch. At last, I was done with the installation of the conversion kit! On my last Vader conversion, I used a custom-cut PVC chassis. While it worked acceptably well, the truth was that it just wasn’t up to my standards. It didn’t look great and I didn’t trust it to hold the soundboard securely. For this build, I opted to use MHS V1 chassis disks from TCSS. 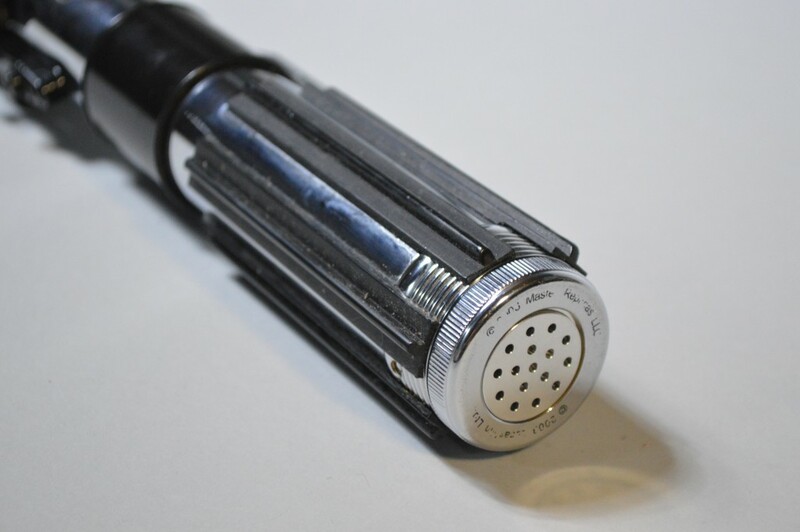 The MHS V1 standard specifies an internal diameter of 1.25”, which is a good bit narrower than even the Black Series Vader, much less the 2003 Master Replicas hilt. However, some parts, like the V5 speaker mount are intended to lock in-between the threaded portions of MHS parts. 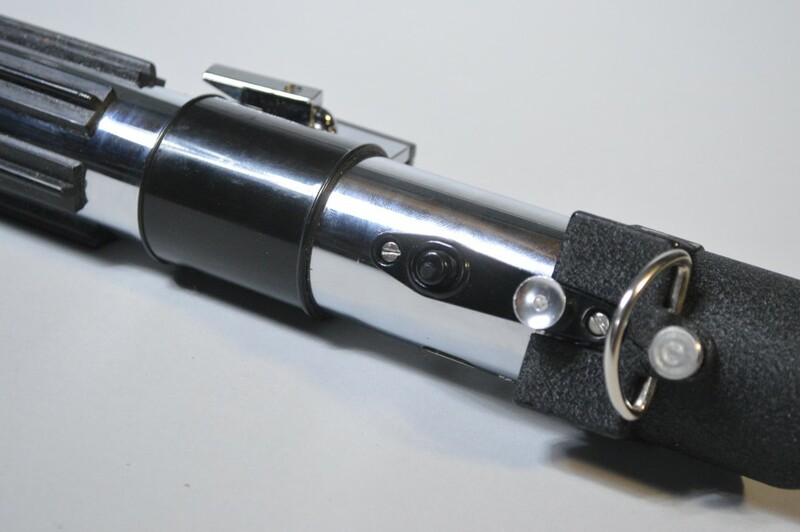 As such, they have 1.31” outer diameters, which fit very well inside these Darth Vader lightsabers. 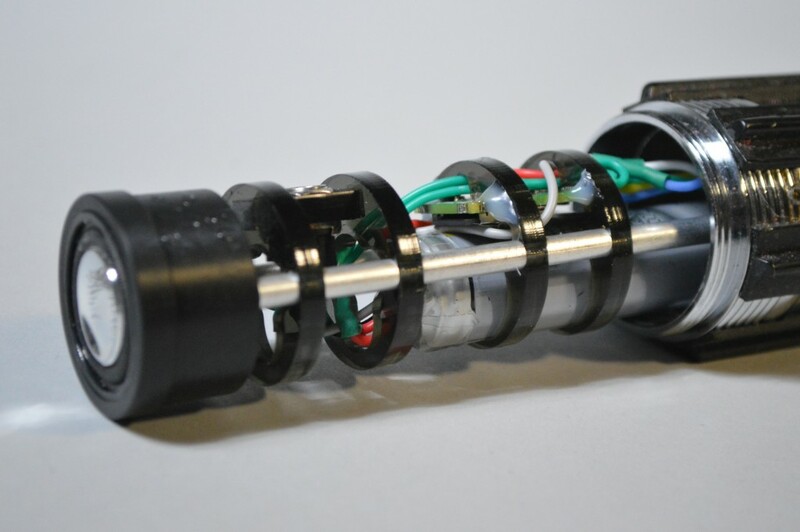 For this build, I used the V5 speaker mount and a 1.31” diameter chassis disk to keep the chassis from wobbling and the whole unit was secured with an 8-32 set screw inserted through a drilled and tapped hole at the bottom of the saber’s body. Using an MHS chassis in this build made organization a breeze. Aside from securely holding the Nano Biscotte soundboard, the other advantage of the MHS chassis system is that I could add a recharge port for the 2,600 mAh 18650-sized Li-ion battery. As a general rule, I strongly prefer recharge ports over removable batteries – particularly for customer builds. Removing and inserting batteries strains the chassis and I worry about damage after long-term usage. With recharge ports, this concern is mostly eliminated. The MPS pommel insert fit perfectly here. This time around, I also opted to use Plecter Labs’ Nano Biscotte V4 soundboard. The NEC Spark 2 worked well in my original Vader conversion, but the NBv4 is miles ahead in terms of ease of install and motion sensitivity. It’s also a far better board than the V3 model. With an additional sound bank, more swing/clash sounds, and much improved motion detection, the Nano Biscotte V4 is a superb soundboard. 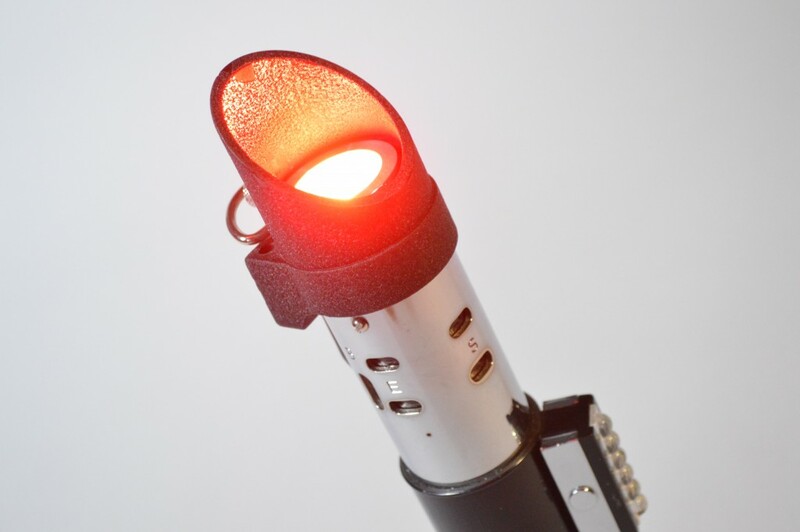 Of course, it also supports pixel-style LEDs like Neopixels, but that doesn’t apply here. This build used a red, deep red, white Tri-Cree LED. I’ve since moved to deep red, deep red, white Tri-Crees for most of my Vader conversions, but the red/deep red combo makes for a nice, medium red with only minimal orange tone. 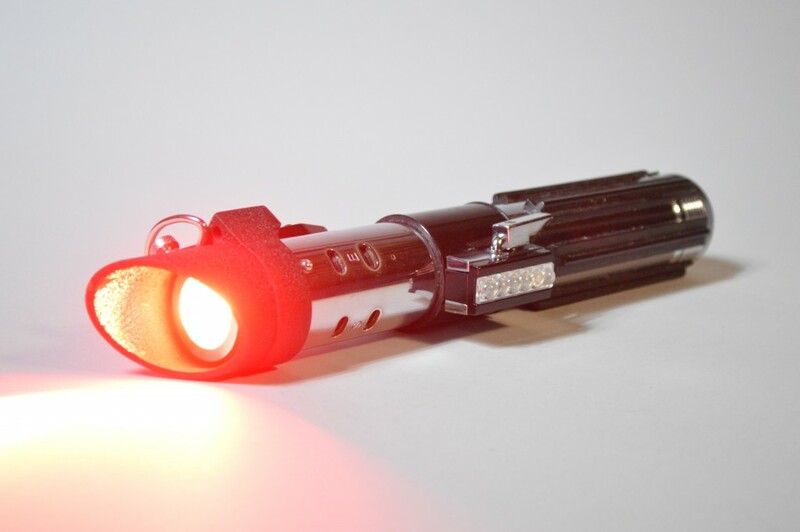 Of course, using a Tri-Cree meant this was a much, much brighter saber than it was when it had the Master Replicas LED string. 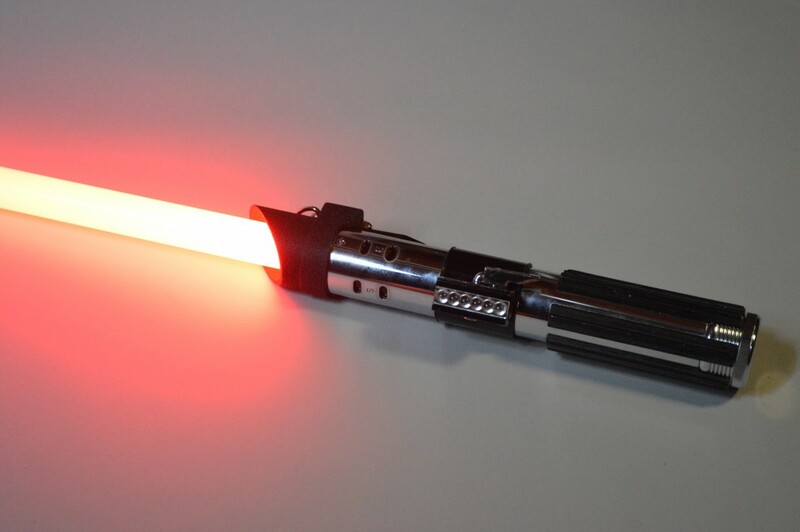 The end result was an awesomely bright saber. As far as sound is concerned, this build relied on the 28mm Veco bass speaker from TCSS. It’s a decent speaker, but could use some help in the clarity department. The character sound font I installed was Madcow’s Vader OT and I tweaked the Nano Biscotte V4 lighting parameters for a shorter, more dramatic flash-on-clash (FOC) to match the sound font and film effects. Usually, I include an Ultrasabers Mid-Grade blade with my Force FX conversions. However, in this case, the buyer wanted me to use a Saberz Starlight blade. In my opinion, Saberz has perfected the non-component (in-hilt LED) blade. Theirs offer almost-perfect tip blending and great overall diffusion. I’m comfortable saying that no one makes a better looking blade. I hope readers have enjoyed this saber run-down. Those who are interested in a similar Force FX conversion, or any saber build for that matter, should contact me through my services pages. Love this article. I still chose a spark-2 rev3 board for my son’s saber fix and a modified PVC pipe chassis. The new lower price and enabled -c1 thru -c3 LED leads are a nice touch. I’m still looking for a good time to rip it down and put it all back together. Thanks for your insight, knowledge, and help!